Spotted Salamander Egg Masses at the Earthshine Nature Center! A few days ago I was hiking in a remote forest with some friends when I came upon an ephemeral pond that was almost dry. 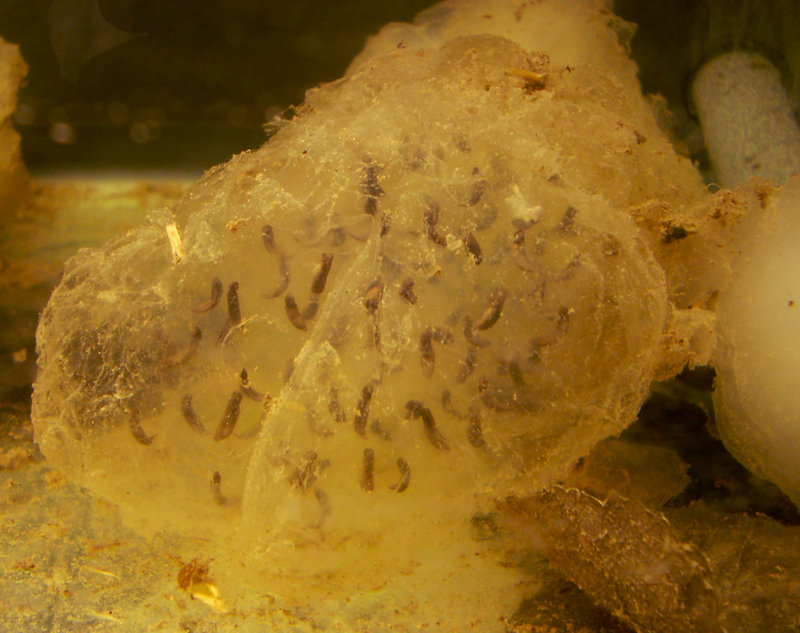 In the pond were several egg masses of the Spotted salamander. Due to lack of rain over the last few weeks the water had already receded below many of the egg masses and it was only a matter of time before the remainder of the egg masses in the small pond were above water as well. I decided to rescue a few of the egg masses and attempt to hatch them in the nature center to give some of the salamanders a chance at life. I was able to retrieve 5 of the masses from an area where the water had withdrawn leaving them 1/2 submerged and 1/2 exposed to the air. I took them back to the Earthshine Nature Center and placed them in an aquarium with clean, still water. The larval salamanders are developing quite quickly and hopefully they will hatch soon and I will be able to release them into the amphibian pond at Earthshine. Take a look at one of the egg masses below! I will keep you posted on their progress.